I so far know of nine former Falkirk players who perished in "The Great War", this is in no way exhaustive and will continue to look. Mrs Conlin, Coatbank St, Coatbridge, has received a letter telling him of the death in action, on 24th June, of her husband Pte. James Conlin, H.L.I. Pte. 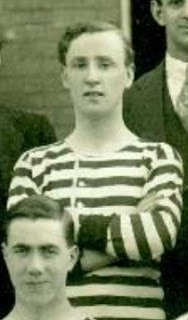 Conlin was a well known sportsman and for some time played with Falkirk Club. It was with Albion Rovers, however, that he attained fame and thereafter played with Bradford City. He was capped twice for England in one season in the Association and League Internationals against Scotland. He was also at one time in the Manchester and Birmingham elevens. On his return to Scotland he played with Airdrie for one season. Information has come to hand to the effect that Chief Petty Officer Robert Graham, H.M.S. Invincible, is not included in the list of survivors. His parents, Mr and Mrs Robert Graham, who reside at 4 Arbuthnot Street, Camelon, Falkirk, received the sad news from the deceased's widow, who was officially informed of his death by the Naval Representative of Leicester, where deceased resided. Chief Petty Officer Graham, who had been about seven years in the Navy, served first on the Roxburgh, and while on another ship at Portsmouth he attended a Torpedo School to study electricity. He was since then, for over four years, attached to the Invincible, and was then promoted to Chief Petty Officer in the Torpedo Department. In January 1915, he was on board the Invincible when it was engaged with the German Navy off the Falklands Islands, and afterwards he sent home a vivid description of that naval engagement. This sometime later, was published in the Falkirk Herald. It may be mentioned that not later than three weeks ago Chief Petty Officer Graham was home on furlough and in Camelon for a short time. Prior to enlistment, he was employed as an engineer with Messrs Sharp & Sons, engineers, Camelon, where he served his apprenticeship. Deceaced was an enthusiastic footballer, and in the early days of professionalism played for Falkirk Football Club. He had had a place in both first and second elevens. He was 32 years of age, and a widow and child survive him. Two of his brothers are serving with the Scots Guards. Alexander has been in the regiment for seven years, and at the battle of Loos was wounded. His brother Allan has been for over four years in the Scots Guards, and he also was in the famous charge at Loos, where a bullet entered his neck and made its way to his stomach, where it still lodges. 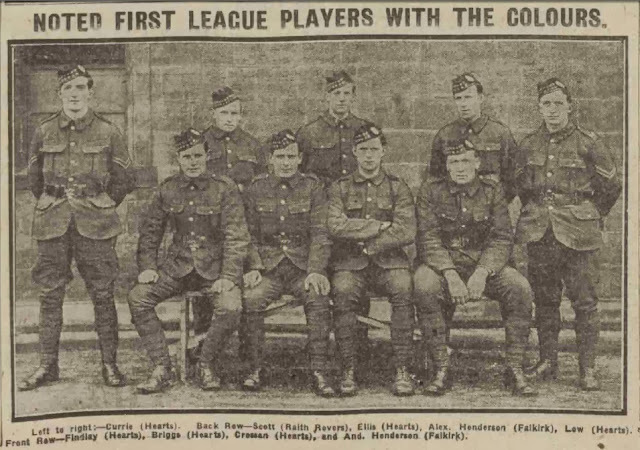 Footballers have played their part nobly in the great international battle, and to the long list of players who have made the supreme sacrifice has to be added the name of Robert Graham, one of "Jocky" Simpson's first partners at Falkirk. Graham, who was 32 years of age, was an electrical artificer on board H.M.S. Invincible, and went down with his ship in the great naval battle off Jutland. A native of Camelon, Graham played for Scotland in the Junior International match in 1902-03, and after assisting Falkirk, where his association with Simpson secured the designation of the "Jock" wing, he went to Leicester Fosse. Three years ago he married a daughter of Mr E. Benn, a member of the Fosse Board of Directors, and he leaves one child. A sailor colleague, who acted as best man, was killed in the same battle. News was received on Sunday by Mrs. A.B. Johnston, 18 Garthall Place, Falkirk, to the effect that her husband, Acting Bombardier Alexander Johnston, R.G.A., had been killed in Flanders on the 17th August. The Bombardier was well-known in Falkirk and District, having been for fully 20 years in the Falkirk Post Office, and latterly as a postman. He joined the R.G.A. in June 1916, and was transferred to France about two months ago. He was 37 years of age. At one time Johnston was a prominent member of the old Falkirk football eleven and for some time was also associated with the old Camelon team. He was of a cheerful disposition and very popular with his colleagues and with the general public. He is survived by his widow and a young family. Information has been received in Falkirk that Corporal A.B.McCrae, Lovat Scouts, has been killed in action at the Dardanelles. 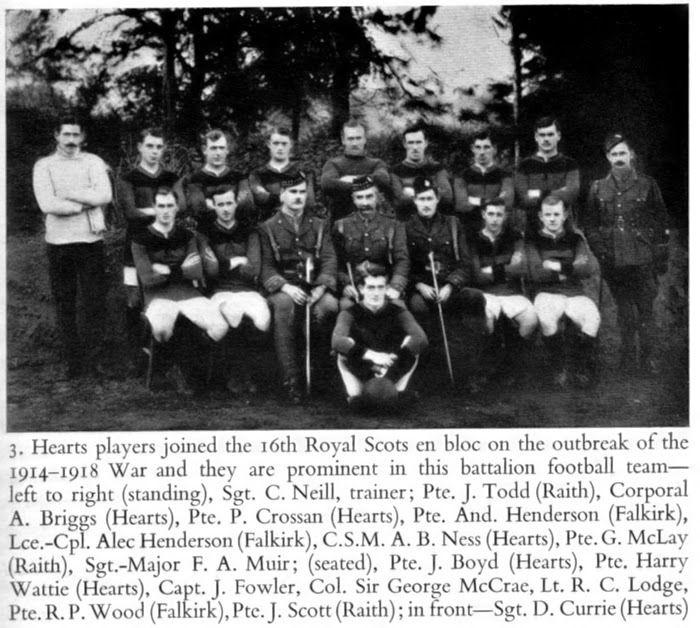 Corporal McCrae was formerly a well-known footballer having played for Queen's Park and Falkirk. Prior to enlisting he was employed by a Falkirk firm of writers. Mrs. Ramsay, 124 Dundas Street, is the recipient of a letter from a naval officer, which states that her son, A.B. J.B.Ramsay, R.N. division, 20 years of age, was on 24th April killed while on active service. The letter reads: "He was killed in one of the most difficult actions the R.N.D. have ever been in, and he died like a Scotchman. He was a good lad, liked by men and officers alike, willing and obedient. You must be justly proud of your son." This young sailor was through the Dardanelles campaign, having been a year and nine months on active service, and two years this month with the Navy. He was very well known as a football player for Falkirk, and originally worked in the boatyard. This is the second son Mrs Ramsay has lost through the war, another son, Alexander, being also fatally wounded while in action with the R.N.D. some time ago. Another son was discharged through his extreme youth, but expects to be called up again, and her husband is serving in France. Private James Sharp was also attached to the 7th A & S Highlanders. He was 21 years of age, and the son of Wm. Sharp, miner, East Borland. Last Saturday, Mr. and Mrs. Alexander Taylor, Prince's Park, Falkirk, received official intimation that their son, Pte. Harry Taylor, was killed in action on 27th May. Pte. it will be remembered, played for Falkirk, Cowie, King's Park and Stenhousemuir at different periods and was a left winger of average ability. He was a mason to trade, but for 3 to 4 years was employed by the Callendar Coal Company as a brakesman. Private Taylor enlisted in the Gordons at the commencement of the war, and six months later proceeded to France. he had been wounded twice, but very slightly. He was in his 26th year. Another brother, also in the Gordons, has been confined in hospital in England for the last three or four weeks, suffering from gunshot wounds in the arm. Official intimation has been received by Mr and Mrs John Laing, 18 Carronhall, Carron, that their youngest son, Pte. 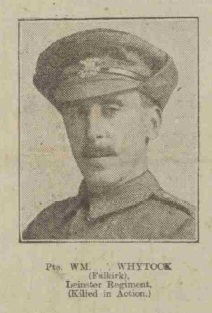 James Higgins Laird, A & SH, was killed in action on 23rd April. Pte. Laing, who was in his 20th year, was, prior to his enlistment, employed as an engineer in the "E" Department, Carron. He joined the Territorials in September last, and was drafted to France in January. In football circles he was well-known, he being one of the regular players of the East Stirlingshire Club, which club had his services from Falkirk, who held his League signature. 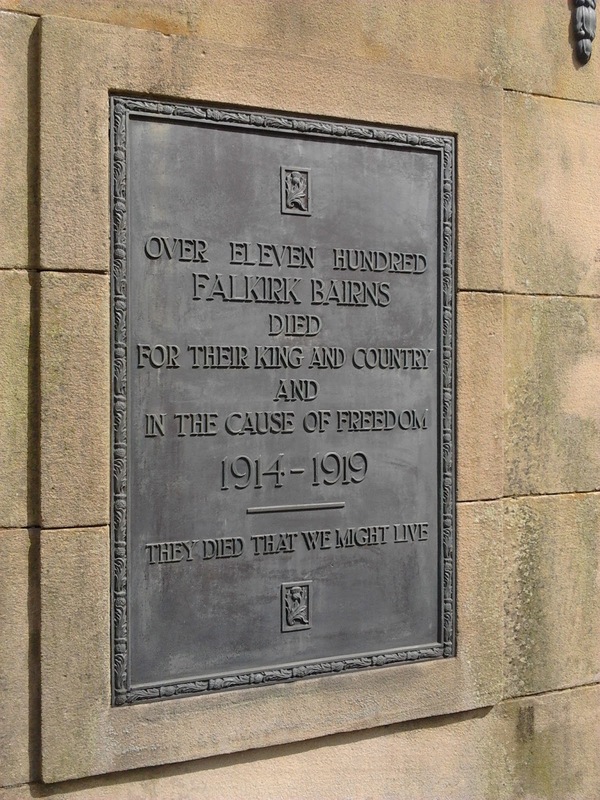 NB - I am working on a list to come below of the Falkirk players who also served during the war, but this is much more tricky. Later club trainer with Bradford Park Avenue then Leeds Utd. Known Career – Tain St Duthus, Unknown Edinburgh Junior Club, Falkirk [1906/07-1907/08], Alloa Athletic, Victoria United (Dingwall), Tain St Duthus. NB - on his Canadian Miltary Attestation papers his Date of Birth is given as 25th March 1881. 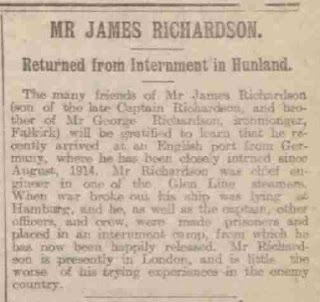 Note - Although not a combatant in World War One, James Richardson was serving aboard a steamer which was in port in Hamburg when the fighting broke out. James and the rest of the crew were interned in Ruhleben for most of the war.